In music as in life, you cannot have it all, you cannot hear it all. There is too much music coming out to experience all of it. I cannot keep up with all of it, even if it made sense to do so. So one is content to follow one's musical nose and check out things one knows something about already as well as things one knows nothing about. Aaron Jay Kernis and his music until now have dwelt for me in the category of the unknown. He was born in 1960, is very much with us. He won the Pulitzer Prize in 1998. He has written a good deal of music. So today I am finally catching up with him on a disk that showcases three works written in the last several decades. 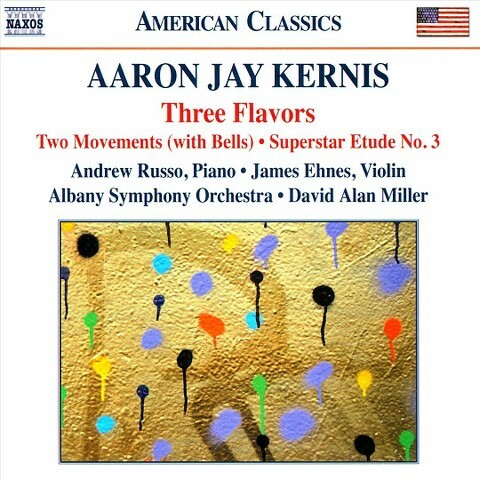 Three Flavors (Naxos 8.559711) gives us a sort of smorgasbord of possibilities, the title work (2002/2013) for piano and orchestra, "Two Movements (with Bells)" (2007) for violin and piano, and "Ballad(e) out of the Blue(s)--Superstar Etude No. 3" (2007) for solo piano. "Three Flavors" has a modern ring to it, occasionally vaguely Messiaen-esque in influence, well scored, vividly moving along with some jazz influences and lots of dynamic turbulence for both piano and orchestra in the outer movements, advancing the tonal spectrum without abandoning tonality. But there are lyrical moments throughout, especially the middle movement where there is a marvel of a "Lullaby--Barcarole" with some very tender passages. "Two Movements (with Bells)" is a virtuoso showcase with neo-romantic passion and more very mobile structures-in-motion. The second movement is more reflective and apparently is dedicated to the composer's father. It in its own ways hearkens back to the highly expressive effusions of a time when late romanticism was crossing the threshold into high chromaticism and modernity, but manages to bear the signature imprint of a composer who appropriates and transforms more than imitates. The violin and piano parts are highly idiomatic yet singularly poetic. In the end there is a magically sad expressivity that almost reminds of the beautiful concluding part of Berg's "Violin Concerto," though in its own right and with an immediacy that speaks to us. "Ballad(e) out of the Blue(s)" concludes the program with an alternately ruminating, then extroverted sort of fantasia for solo piano that combines a rubato blues feel with modern expressive elements. An appealingly difficult-to-play work it is, both evocative and exploratorily modern-soulful. Thus ends the disk. Performances are quite good. 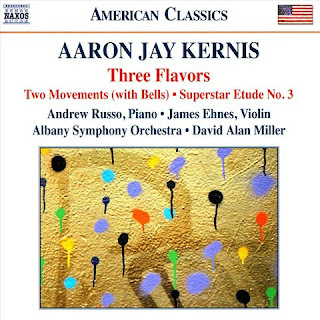 Andrew Russo takes command of the piano parts throughout with a convincing warmth and drive; the Albany Symphony Orchestra under David Alan Miller do good work in realizing the first piece, and violinist James Ehnes drives the middle work with a passionate flight into solo violin singularity. So there we have it. This is a disk that shows us what the later Aaron Jay Kernis compositional ethos is all about and it is good. The music has a modernity that does not dwell at the edges as much as squarely situates itself in the center, both synthesizing what we have learned and heard in the last 100 years but then taking that and making it original and contemporary. I think this music has the potential to appeal to a wide audience, modernists surely, but then also those who do not seek to be challenged as much as given melodic signposts and skillfully devised music that is both original and somehow familiar in a contemporary comfort zone. Aaron Jay Kernis is a talent. This is a very nice introduction to his latest music. 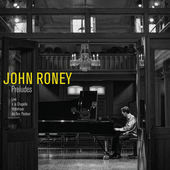 In a mini-series of reviews on the art of the solo piano improvisation in classically related modes, we have today a final example in the playing of John Roney and his recent Preludes (Effendi 138). I was not familiar with his music until now. The album adroitly draws upon classical and jazz themes for its improvisational impetus, so we get mostly familiar such things with Bach, Gershwin, Debussy, Duke Ellington, Chopin and Scriabin. Roney is more concerned generally speaking with making interesting music than packing each improvisation with technical prowess, though he certainly has technique. It's all about taking a theme and interpreting it in whatever way Roney's imagination takes him, sometimes in a shimmering cantabile, a modern openness, influences of a jazz sort, but also quasi-concerted arpeggiations, modulations, reharmonizations and harmonically extended excursions, right-hand melodic inventions against left-hand motival patterns, bluesy moments, in all a full gamut of creative possibilities that call upon everything from romantic piano sounds to jazz and even Emersonian rock influences, impressionist musings and beyond. Can you tell he is more classically oriented than jazz at the basis of his background? Yes and no, since convergences are such that a jazz-grounded player might conceivably produce a series of improvisations like this without sounding surprisingly out of character. But nonetheless the choice of themes and their treatment generally come out of a more classically inundated creative mind. The jazz element is slightly more tentative much of the time. If there is a convergence at times it happens as an outgrowth of his thematic treatment. He can occasionally sound a little Jarrettian, but then of course Keith Jarrett sometimes works out of romantic-impressionist models. Roney may be not quite at the inspired level of Jarrett at his best here. But then he goes his own way as often as not, into territory that sometimes may be less "deep" but engaging and inventive in its own way. The use of familiar themes as springboards will give the listener a grounded sense of where he goes. For those not accustomed to close listening of improvisational moments that may indeed provide you with a kind of musical map to get your bearings. Roney is talented and lyrical as well as dynamic. This is a good listen in a tonally accessible vein from a pianist who is developing his own way. Give it your ears! The music of Iannis Xenakis (1922-2001) is like no other. The fact that he used computer algorithms to aid in composition has sometimes led people to misunderstand his centrality in the creative process. He did not simply push a button and out popped the music. The conception and ultimate results were his. Otherwise they would not so consistently embody his signature stylistic universe. The formidable percussionist Kuniko gives us two major examples of Xenakis's works for percussion on the album entitled IX Kuniko (Linn CDK 492), which is a hybrid CD capable of multi-channel playing as a SACD or standard two-channel playback on a standard CD player. I was unable to audit the multi-channel version because I do not have SACD capability, but the sound in any event is glowing. The four movement Pleiades (1978) begins the program. It is scored for six percussionists and so Kuniko resorts to multi-tracking to realize the work. Each movement occupies its own sound universe. The specially designed SIXXEN is featured prominently in the second movement. It is a bell-chime like multi-piece percussion instrument that gives out with a special evocative resonance. The other movements have a broad array of instruments both pitched and unpitched. Kuniko's performance is unparalleled, as is the work. "Rebonds" (1988), a somewhat shorter two-movement work concludes the program. It is designed and played for a solo percussionist using a set ensemble of percussion instruments, mostly "drums" and a set of wood blocks. It is extraordinarily difficult to play and Kuniko most certainly triumphs here. The complexities and sheer aural delight will quicken the pulse of any percussion music adept, but it makes for a wonderful music listening experience in any case. Some of Xenakis's music demands much of the listener, especially in the days when extreme modernism was not always welcomed by the typical classical listener. Times have gone by and his most difficult works no longer sound nearly as challenging now to our ears. We have all grown in our ability to hear and understand complexities and the new language of modern music. But in any event the percussion works here and their marvelous performances by Kuniko can be readily appreciated, I would think, by anyone who is open to the new. They are not difficult listening, quite the contrary. Some amazing percussion music can be heard on this one. Bravo Ms. Kuniko. Bravo Xenakis! 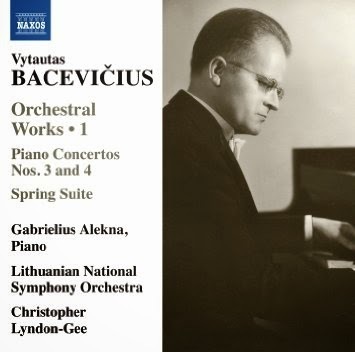 Today, another 20th century modernist composer who has suffered neglect, one Vytautas Bacevicius (1905-1970), brother of the far better-known Grazyna Bacewicz. His legacy and its relative obscurity have something to do with the fate of circumstances. He was on tour concertizing as a virtuoso pianist in South America when WWII cut him off from his Polish homeland. He migrated to the United States and lived out his years there with some success but perhaps more as a pianist than a composer. If he is all-but-forgotten today, a number of recordings seek to redress that, most notably his Orchestral Works I (Naxos 8.573282), played by the Lithuanian National Symphony Orchestra under Christopher Lyndon-Gee. Three works get our attention, two of which enjoy first recordings. They all stem from his period of exile, ranging from 1946/49 through 1962. Piano Concertos Nos 3 & 4, the latter in first recording, feature pianist Gabrielius Alekna as soloist. The 1958 "Spring Suite" appears in the middle of the program, and is the other first recording. All the music has an Eastern European modern chromatic expansiveness. The album shows us a composer that perhaps has Scriabin as an influential forebear but otherwise seems to move within his own orbit, neither archaic nor Serialist-Darmstadtian. It is music well thought-through and takes a few hearings to assimilate. The Fourth Concerto is something of a major find, with a difficult and dexterous piano part, a very advanced orchestral presence, a very modern feel to it, on the edge of tonality and beyond. The performances are good, especially those by soloist Alekna. There could possibly be even better performances someday but for now this gives us a vivid, balanced and dramatic picture of a compositional personality that deserves recognition. Anyone with an interest in Eastern European modernists should hear this one. And so should anyone following 20th century developments. I will certainly want to hear this disk a good many times more. It is complex and satisfying music that sounds fresh and very much alive. I look forward to future volumes. I somehow missed the music of Tristan Murail, even though he taught composition at Columbia, studied with Messiaen, and has had a distinguished career this far. Never too late as the adage goes, since the new CD of his works is exceptional. Le Partage des eaux, Contes cruels, Sillages (aeon 1222) gives us three of his recent works for orchestra. They are notable in their sonic sculptured vibrancy of sound. These are all first recordings. "Le Partage des eaux" (1995-1996) leads off the program with a large version of the BBC Orchestra, electronics, and compositional results coming out of the spectral analysis of a breaking wave and its backwash that is translated into uncanny sound color, both gestural and very poetic. The music sounds like no other, but extraordinarily musical and modern in the highest sense. The BBC Orchestra gives us a phenomenal sonic palette. 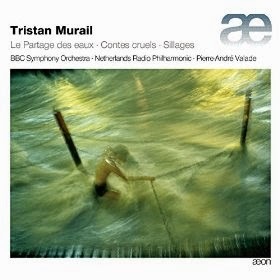 "Contes cruels" (2007) and "Sillages" (1985) are both performed well by the Netherlands Radio Philharmonic. The former is for orchestra and two electric guitars tuned a quarter tone apart in a not quite concerted role but whose parts are integral to the work. Wiek Hijmans and Seth Josel take on the guitar co-solos and give them an avant metal sort of ambiance that fits very well with the dynamic and sonically spectacular orchestral parts. "Sillages" has yet another atmospheric take on sound color. It continues in the vein of the previous two works without in any way repeating what they have established. It is a musical impression of the Zen rock gardens of Kyoto, with their undulated earthen raking surrounding the rocks. Whether you are aware of this or not does not effect your appreciation of the startling qualities of the music, but in the end it makes a certain sense. This is orchestral music of such a singular sonic vision that it goes miles forward in what we have come to expect. It is other-worldly. 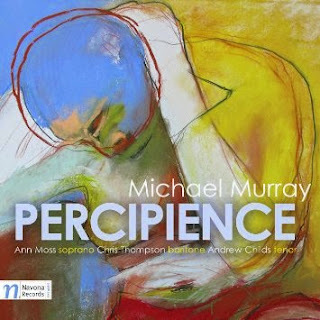 Murail is a brilliant composer-orchestrator and these works positively stand out as extraordinary tone poems for today. It is music that advances the modernist agenda in ways that will enthrall anyone with open ears. Such sounds you have never heard! This music has a structural logic that comes off as anything but random. Conductor Pierre-Andre Valade clearly understands this music and brings out the swells of exotic sounds with care and brio. I cannot recommend this one heartily enough. For modernist fans it is a godsend, but even those with some reticence should be able to revel in this most innovative world. Molto bravo! There are composers of recent times who have lurked in the shade of neglect for too long, whose music was not as a rule widely heard until now, who lived much of their lives in some obscurity, whose output was not in keeping with the prevailing trends. One of those certainly is Havergal Brian (1876-1972). His 32 symphonies until recently were virtually unknown, with the exception of the monumental giganticism of the first few, which were performed by esteemed conductors like Boult and available as a few very obscure LPs. Incredibly enough, after completing his 6th Symphony at age 72, Brian went on to write 26 more from that period until his death, along with operas and other orchestral pieces. Naxos has been filling us in (thankfully) with a cycle of the works. 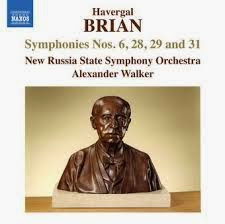 Today we get the New Russia State Symphony Orchestra under Alexander Walker playing Brian's Symphonies Nos. 6, 28, 29 and 31 (Naxos 8.573408). Nos. 28 and 29 are first recordings. So these are a sampling of those late works. Brian began as a long-formed English late romantic in an era when it wasn't unheard of to work in the style, though at the time he was aside from Elgar one of the very few English composers who intently took on the mantle of the last of the romantics. Elgar of course was no Mahler and he did not push romanticism to the edge as much as he reflected a Victorian restraint along with a vital fluency and passion that played against itself. Brian was more overtly expressive, less bridled. His music, as much as I am familiar with the middle period, was never contemporary in the same way as Vaughan Williams or Walton. It remained in many ways anachronistic yet not derivative. So here we are with some of the many "last" symphonies. They are of modest length compared to the early works, ranging from a 13-minute 31st (in one movement) to the multi-movement 29th, which clocks in at 23 minutes. With the temporal brevity is a compactness of expression that Brian's music had evolved to. There are long thematic developments at times (the third movement of the 29th, for example) which have an almost Schubertian thrust, yet on the whole he is much less the epicist of his early late romantic days. Granted there remains the high expressivity often enough of his earlier work, but there are neo-classical elements peppered through the works and his originality is much more at hand. It is not "modern" music as a whole, yet it sounds chromatically contemporary and fresh. If you seek analogies of the period, he perhaps shares with Sibelius the natural propensity to work in older tonal territory, yet like Sibelius he does it in his very own way. You might say that his music has a sterner cast than Sibelius, and the chromaticism sometimes comes much more to the forefront, as a kind of English Max Reger, though these are only loose approximations. Brian remains at this later period a symphonist of real stature, original in ways we may not expect of music written in 1948, 1967 and 1968. We tend to think of classical music teleologically, noting in admiration that so-and-so was the prophetic precursor of the so-and-so school. Brian was not that. If we forget about teleology though, he speaks to us truly, no matter what came before, after or during. The four symphonies programmed on the current release give you a listening experience both fascinating and rewarding. The New Russia State Symphony Orchestra under Walker furnishes us versions that sparkle with sonic vitality. There is enthusiasm to be heard and a full commitment to the stylistic particularities. Could there be better performances? Perhaps. But we are well served by these recordings and get the full impact of Havergal Brian and his tremendous burst of energy in the last decades of his life. And that's what counts. It's remarkable music in all these ways. I am very glad to experience it and am left with a much greater appreciation for Brian's music than I had previous to this. Recommended! 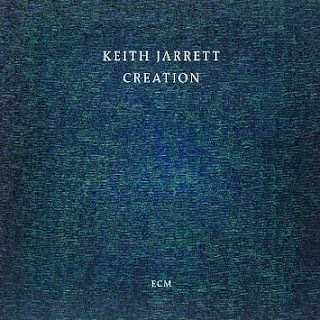 Keith Jarrett celebrates his 70th birthday with two releases. One a solo piano disk, Creation, which I covered on the last post. Today there is the second, a live recording from 1984-85 of two seminal modern concerto works that give us a look at Keith at a peak in his classical performance style, before a skiing accident injured his hands and he was no longer able to play at the highest edge of virtuosity. Lucky for us these live versions were recorded before that calamity and we get his versions in all their considerable splendor and smouldering, blazing fire. They are available now as an ECM New Series release (B0022987-02) Samuel Barber Piano Concerto, Bela Bartok Piano Concerto No. 3. As live, unedited recordings they do not have the extreme polish of a carefully done and redone studio date, but they make up for in excitement what they may lack in absolute perfection. Two orchestras and conductors handle the accompaniment; for the Barber it is the Rundfunk Sinfonieorchester Saarbrucken under Dennis Russell Davies, for the Bartok it is the New Japan Philharmonic Orchestra under Kazuyoshi Akiyama. They give us warm and committed versions of the works, not absolutely perfect given the live situation, but no discernable clinkers either. They enter into the spirit of the music as called upon, and they do it admirably and satisfyingly. The center of attraction remains rightly with Jarrett and his artistry. 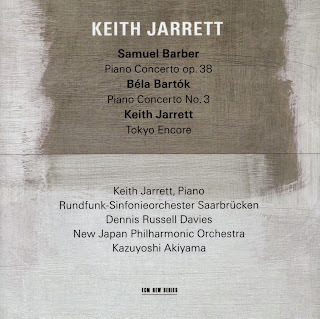 Both works are superb modern 20th-century examples of the concerted art and Keith does wonders with the piano parts. The Barber is less played than one might like, but is a masterpiece, with devilishly difficult pianistic demands and a very modern sound, Barber at his best. The Bartok is familiar to most and gets more than its due. Jarrett is breathtaking much of the time in his flowing, nuanced yet pyrotechnic performances of the works. He immerses himself in both works and yet manages to convey his incredible personal pianistic magnetism, which bursts forth with triumphant energy and lyricism in both cases. Repeated hearings bring home the brilliance of his way with the works. The program ends with a solo improvisation from the Japanese concert. It is rather brief but glowing and a very fitting end to this welcome addition to the Jarrett discography. You may well have versions of both concertos. The Jarrett versions are so distinctive that they should be heard nonetheless. A triumphant trip on the musical time machine we get. I can't imagine a better birthday tribute to the master pianist, when coupled with the latest solo improvisations on the release Creation. These two along with a previously unreleased classic trio date from the earlier years (see my Gapplegate Music Review article from several months ago for that) gives us a three-pronged semi-retrospective/introspective on virtually all that Jarrett means to us. I am very happy to have them to hear in the years to come and I imagine you will, too. But by all means get this one regardless of whether or not you follow the more jazz-oriented side of his artistry. It is golden. Pianist Keith Jarrett recently turned 70. To celebrate the milestone he has released simultaneously two albums, one a recording of two concertos I will discuss soon, the other an album of solo piano improvisations called Creation (ECM 2450 B0023013-02). I deal today with the latter. Jarrett, along with Cecil Taylor, has been monumentally influential for his solo improvisations throughout his career. His excursions in this realm have had a wide acceptance with the music-loving public; they have been critically acclaimed; they have given us a dimension of improvising which incorporates both his jazz background and classical elements. The earlier examples had much in the way of spectacular technique. The later period is less concerned with that realm, the playing stripped down to communicate directly with more somber or reflective expressions of a concentrated sort. That is especially true of this one. Creation, consisting of nine segments drawn from six 2014 concerts, were personally selected by Maestro Jarrett and form a cohesive whole. These are nocturnals, meditative, introspective, balladic, harmonically centered and melodically improvisatory. They seem a natural outcrop of Jarrett's increasing attention to balladic standards but also to a sort of original equivalent to aspects of Chopin or later Liszt, both beautiful and somewhat stark. If I post this album here on the classical page, it is because these improvisations should be of interest to the classical listener as much as those who come to his music out of his jazz background. Those who know a good deal of his work in the solo realm over time will know that the later period often enough marks a more reflective Jarrett, less exuberant, less the spectacular virtuoso, less ecstatic, more somber, yet still extraordinarily lyrical. And yes, this aspect of Jarrett the artist has nearly always been a part of his style, but never before in such concentric terms. There are extraordinary moments on this one, to be sure. I won't say that there are intimations of mortality in some direct sense, but of course as you get older you lose friends, colleagues (Paul Motion and Charlie Haden in the last few years, for example) and if I detect a eulogistic tone in this music, it may be because I know how loss can color one's life after a certain stage, and the realization that your own life may not last another 100 years. But I do hear a kind of looking back, a feeling of coming through much and a reflection on it. It is a beautiful album. It is not what earlier Jarrett solo improvs dwelt on at such length, but that is what sets it apart and distinguishes it from them. There is still inspiration, much of it in these segments. If you approach it with no expectations (as much as that is possible) you will no doubt fall under the spell of the moods and be transported as I have been to a magical realm. This is introspective later Jarrett at its best. He remains brilliant in new, perhaps more subtle ways. Bravo! In musical terms, how does a post-modern/modern composer capture the world we live in today? The answer would have to be "variously," since there is no one way. One answer comes from the relatively young (b. 1975) Finnish composer Sebastian Fagerlund, as heard in a recent release of orchestral works, Darkness in Light (Bis 2093). Hannu Lintu conducts the Finnish Radio Symphony Orchestra. Two works are presented, both written this decade, the "Violin Concerto 'Darkness in Light'" (2012) featuring violinist Pekka Kuusisto, to whom the work is dedicated, and the purely orchestral "Ignite" (2010). Both are atmospherically lucid, modern sounding with expanded tonality and orchestrational brilliance, but post-modern I suppose with their original forays into more tonal moments. The immersion in tonality shares with the harmonic-modernistic passages a complex, turbulent dynamism that can acquiesce into more open, reflective passages in dramatic arcs. Kudos to violinist Kuusisto, who handles the solo part with a sort of heroic distinction, and to conductor Lintu, who brings us the special qualities of Fagerlund's music with sympathy and real presence. Fagerlund opens us to a world complex and perhaps less unified or monolithic than it is dramatically ever-unfolding. In a way Fagerlund sums up the modern sound-coloristic orchestral legacy while moving forward simultaneously into his own personal sphere of sonics. The music is well-written, well-performed and complexly vibrant. Fagerlund bears close listening, reveals himself in real and repeated listening time rather than awes you with visceral fireworks. That he will please the careful auditor is doubtless the case (at least with me), but he presents music on his own terms, not pandering for easy recognition and applause but single-mindedly seeing a path into the future we may follow at will with considerable reward. A figure to be heard, Fagerlund most certainly is, and a composer doing excellent work which I can only hope will continue to grow and excel in the coming years. When a composer is still living and producing new music, the complete picture continues to reveal itself. Even after passing that composer may have works that are not universally known, so that we cannot be sure we know all the avenues and byways of style that the person has traversed. The latter is true of Hans Werner Henze, who left this earth in 2012, but whose later works are still being absorbed by the new music community, myself included. Today's recording is a revealing example of this, with two compelling concerted works for solo violin and ensemble, both written in his mature phase. Peter Sheppard Skaerved plays the solo part in each case, and also serves as conductor for the later work. We get Henze's Violin Concerto No. 2 and Il Vitalino raddoppiato (Naxos 8.573289). The Concerto No. 2 comes from 1971, "Il Vitalino" from 1977. Both are unfamiliar to me but it turns out are quite engaging and well performed here. "Il Vitalino raddoppiato" is in an Italianate neo-baroque style, with a cycling continuo chord sequence and violin embellishments structurally similar to the various versions of "La Folia." In this case the work is based on one by Tomaso Vitali (1663-1745). It is a very colorful piece not at all typical of Henze's high modernist period, in that the continually recurring harmonic sequence is firmly tonal, and thrives in the ingenious shifting orchestrations in the chamber ensemble Longbow, principally a group of winds set alongside a group of strings. The solo violin part is both demanding and very lyrical, played beautifully by Skaerved. And the piece as a whole shimmers with beautiful shades of tone. Henze's "Violin Concerto No. 2" is a very modern, ambitious work for of course solo violin, plus electronics on tape, bass baritone and 33 chamber players, played by the Parnassus Ensemble London with Henze conducting. This is the 1991 revised version, with a simplified electronics part, which Henze felt in the original was too cluttered. The work is both theatrical (the violinist in performance is to be dressed as Baron Munchausen) and a concerto. The baritone (Omar Ebrahim) recites-sings a poem by Enzensberger and Godel's Theorem. His role is crucial in giving us the literately dramatic-philosophical content of the piece. It is a beautifully complex work, with the violinist conceived in the romantic embodiment, as Henze explains, "as a magician, a sorcerer with a tragic aura." The solo part is fiendishly difficult at times, but Skaerved soars in the role. There is too much going on in this work to easily summarize. Suffice to say it is a masterwork that gives back as much as you the listener put into the hearing. Both performances are excellent, no doubt definitive. It reveals two sides to the composer, both avant pioneer and re-composer of the historic past, both post-modernist and high modernist. It alerts me to aspects of the composer I have not yet sufficiently assimilated. These two works are revelatory. I now am awakened to his evolving, complex later period and reminded that there is still much to hear. An essential recording, this is. Henze comes though in all his complexities. Bravo. It may well have been a day like today, sunny and spring-like, when I visited the Lincoln Center Music Library and found in the huge holdings of LPs at the time the complete works of Anton Webern (1883-1945), as recorded by Robert Craft. I was 18 and pretty well familiar with Schoenberg and Berg, his compatriots in the Viennese 12-tone school, but I was in for something special nonetheless, as Webern has a completely original brilliance all his own. As I listened to the terse, lucid, mostly miniature works one after the other I felt I had discovered one of the wellsprings of modernity. Of course this was and remains very much true. Time went by and I eventually acquired the Craft set, then the later set of complete Webern as recorded by Boulez, but nothing matched that initial discovery. The Boulez version was excellent, but like much of Boulez's versions of other modernists, there is a good deal of Boulez's own brilliance in the interpretations, so that Webern gets squarely situated in the serialist, Darmstadtian sensibility that he had made possible. The Robert Craft versions were more matter-of-fact, perhaps less interpretive but also perhaps closer to the original Webern intentions. Over the years both versions got my scrutiny and appreciation, and both seemed necessary. Now these many years later I discover that Robert Craft has done a second version of the Webern cycle which has been released on Naxos. I come to the music as the final volume of the series is released, Vocal and Chamber Works (Naxos 8.557516). As it happens I especially liked Craft's versions of the vocal works on the first version of the cycle, and that holds true again for the new recordings. The song sets and Webern's "Cantata No. 1" cover a wide period from 1908 through 1939. 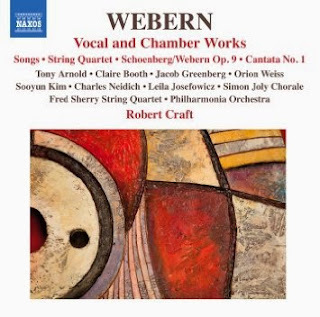 Robert Craft's versions are if anything even more insightful here, with Tony Arnold and Claire Booth singing the parts very convincingly, the Simon Joly Chorale sounding very good, and the intricate instrumental background coming off quite well in the hands of Jacob Greenberg, piano, the various instrumentalists and the Philharmonia Orchestra. In addition the volume covers nicely Webern's "Six Bagatelles" and "String Quartet" as performed by the Fred Sherry Quartet. As a bonus we get the Webern revoicing of Schoenberg's 1906 "Chamber Symphony," which shows us exactly how attuned Anton was to the sound qualities of piano, winds and strings. As always the miniaturist every-note-counts brevity of Webern is wonderfully on display. Robert Craft outdoes himself on this second go-round; nothing is unessential on this final volume of the Naxos series. No student of modern music should be without this one. And for the Webern enthusiast the versions so effectively set out here are a vital addition to the Webern recorded repertoire. Smashing! Get this one if you can. And no doubt the whole set is worthwhile, too. 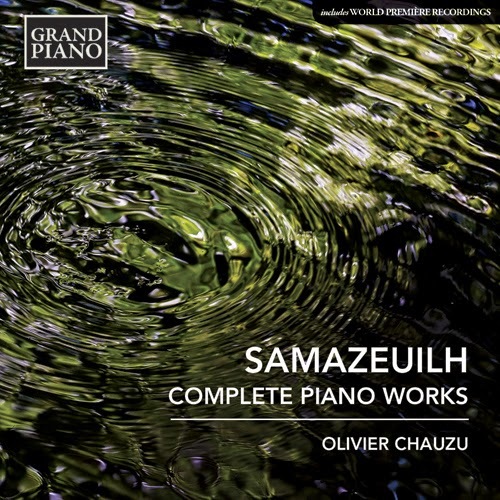 Gustave Samazeuilh (1877-1967) is by no means a well-known name in the compositional ranks. 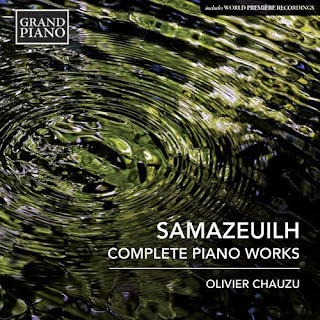 We get the chance to hear his Complete Piano Works (Grand Piano GP 669) in a new recording by Olivier Chauzu. They span a period from 1902 to 1947, eight works in all, one a first recording. As he grew up he came into contact with many luminary composers of the French school, who were family friends. His music reflects his own version of impressionism, at least in the solo piano works, with shimmering surfaces and at times a Scriabinesque post-romantic expressionism. The music on this album is inspired, well-crafted and played extraordinarily well by Chauzu. Some are quite difficult and demanding for the pianist, all are poetic and very luminous, each in its own way. The music demands your respect, for it is by no means of minor quality. I came out of the hearing of this album with a good deal of admiration for Samazeuilh. You will no doubt feel similarly if you give the music a chance. When music is highly experimental, in the very avant garde camp, it is you the listener who must do an accommodation, not the works themselves. That's been the case for me with the two-CD compendium of new music, principally by Bjorn Fongaard, Galaxe (Aurora 5068). 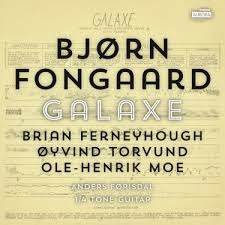 It features music for 1/4 tones/microtones, as played by Anders Forisdal on 1/4 tone electric guitar, with the help of Hakon Stene on 1/4 vibraphone and percussion and Eirik Raude on percussion. There is also a work by Brian Ferneyhough, one by Ole-Henrik Moe, and one by Oyvind Torvund. Mostly it's the sound of the 1/4 tone guitar out front with percussion and vocal at times and some pre-recorded electronics on the piece by Torvund. The "Sinfonia Mincrotonalis No. 1" appears to feature multiply tracked guitars. Throughout you must adjust to the world of quarter-tones in a new music context. That perhaps is a challenge sometimes, especially when they ring out scalularly, less so when a part of sound matrices. The works are concentrated, focused, played remarkably well by Forisdal, with the small ensemble pieces executed with precision and some grace. It is music to grow slowly into, more so than something you embrace right at the start. It will appeal to those souls with a real sense of adventure, students of ultra-modern guitar literature and avant fans. For others it will take some doing to get used to. An adventure for the intrepid explorer! When I was in school I learned that there were two conflicting views of history: the "big man" approach, that looks at major changes as the result especially of important persons. So the Civil War narrative might be centered on Abraham Lincoln and perhaps Ulysses S. Grant, the civil rights movement as a product of the courage and charisma of Martin Luther King, etc. The opposite theory looks at the many little cumulative changes made by lesser personages or the popular ground swell that favors a particular change. Both have their uses, of course. You can see the rise of modern music in terms of the seminal influence of Stravinsky's "Rite of Spring" or you could see it as a product of many more and more chromatic works that preceded and followed it, culminating in a modern tonality. There should not be only one way to see things. And of course these days a "big man" view might involve an important woman. 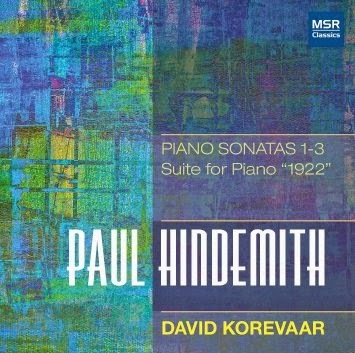 If Paul Hindemith's Piano Sonatas (MSR Classics 1507) (1-3, written in 1936), do not quite have a "big man" status in the development of modernity, they nonetheless form a masterful body of work that helped set the pace last century, and they are works of considerable worth and drama. Hindemith may not have had quite the impact of a Stravinsky, but his influence in the first half of the Twentieth Century was nonetheless not inconsiderable. A new recording of his three sonatas 1936 plus his piano "Suite 1922" gives you all the music as interpreted by the talented and very sympathetic pianist David Korevaar. This is music that is by no means easy to play properly, but David is fully equipped and beautifully interpretive, and so is able to breathe genuine life into the works. As with many vintage Hindemith works from the period, the music has a striking thematic-harmonic quality to it that stretches out into beautifully developed long-form structures you come to welcome on repeated hearings as you would an old friend. I have not heard better performances of these works. They are milestones in Hindemith's output and Korevaar understands them completely. They will give the Hindemith aficionado plenty of joy and they will serve to introduce his music to those unfamiliar in the basking illumination of sympathetic interpretation. They are works that should be heard by anybody interested in the modern movement, and the performances are exemplary. The advent of a world-class group of classical composers in the USA did not come about until relatively late. The group known as the "Boston Six"--Arthur Foote, Amy Beach, George Chadwick, Edward MacDowell, Horatio Parker (who taught Charles Ives) and John Knowles Paine, all more or less came into their own in the final years of the 19th century. All showed originality and compositional acuity, if mostly in the later romantic style. I turn today to the latter composer, with a work I have not previously experienced, John Knowles Paine (1839-1906) and his Symphony No. 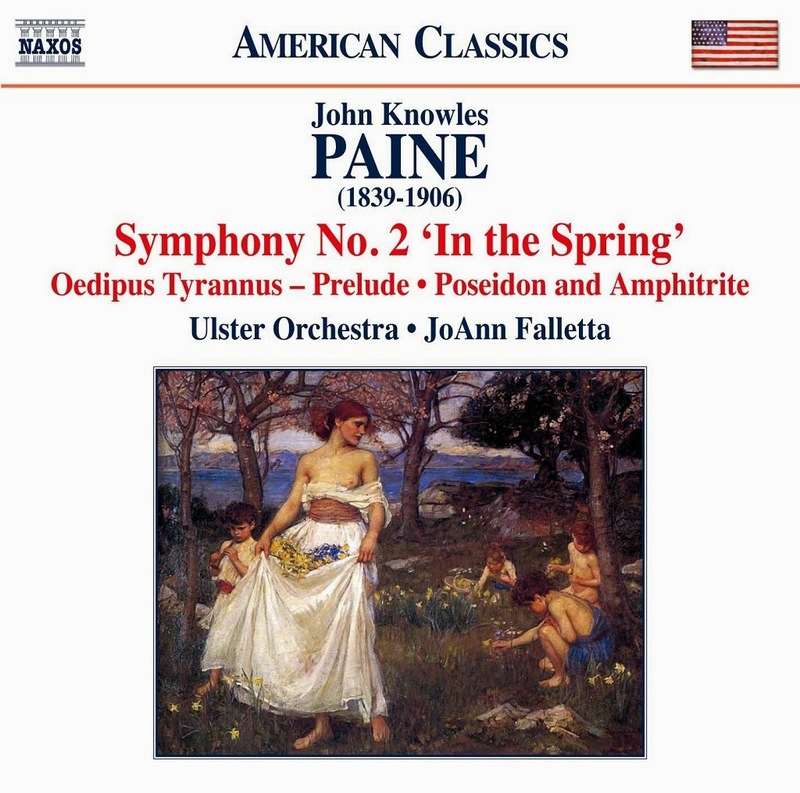 2 "In the Spring" (Naxos 8.559748) in a new recording with JoAnn Falletta and the Ulster Symphony. The 1879 symphony is very solid fare within a general romantic framework. It shows the influences of Brahms and Mendelssohn but then also has a thematic pristineness not overtly derivative. We are also treated to two shorter bonus works: the Prelude to "Oedipus Tyrannus" (1880-81) and "Poseidon and Amphitrite, An Ocean Fantasy" from around 1888. Ms. Falletta once again shows an excellent feel for this kind of music and the Ulster Orchestra responds accordingly. If Paine does not sound like the whirlwind father of American classical music, he set the stage, raised the expectations high for the next generation, Ives, Ruggles, Copland, Gershwin and the others who followed and opened the curtain to a truly local set of styles, rooted in both nationalism and modernism in unique ways. But nonetheless Paine's music is not unattractive. The symphony was a major work of its time in the USA. The "Poseidon" Fantasy strays further afield for some music certainly of its time but worthwhile to hear now. Falletta gives us performances worthy of Paine's music. It is a very pleasant experience hearing it all. If it sets the stage for things to come it also has charm that makes the experience of it rewarding and of course historically illuminating. A good thing for students of the rise of modernism and an American school, surely. Of all the twentieth century composers we recognize as important, Heitor Villa-Lobos is one who occupies his own territory. He is modern, yes, and he incorporates Brazilian folk elements, surely, but there is something else, something unique about his music that goes beyond category, that is much more than the elements that go into his compositions. We also get his 1917 opus, "Uirapuru," a very modern-folkloric amalgam, and his scarcely known secular cantata "Mandu-Carara" (1940) in a good recording that adds the Sao Paulo Symphony Choir and Children's Choir. 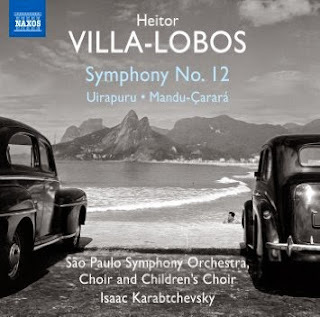 All this gives us a good hour of excellent Villa-Lobos, the symphony in every way a culmination of his work in that medium, rhythmically vital, harmonically rich, with orchestrations that bring out his mastery of orchestral sound in the four-dimensional way only he could conceive of. And the bonus works are far more than extras, important in their own way and a pleasure to hear performed with the zeal, excitement and care that typifies the series. There is nothing lacking in the recordings, the performances and the quality of the compositions. Anyone seeking to understand Villa-Lobos will be well-served by the album, as indeed will those who already love his music like I do. Excellent. More than worth the modest investment. Many stars, if I were to rate things that way! Song cycles, lieder, I don't seem to hear much of it in the most contemporary releases. No doubt I am missing some of it. An exception is Michael Murray, whose anthology of four song cycles, Percipience (Navona 5994) impresses me. He was born in 1964, which makes him younger than I. He currently teaches composition and theory at Missouri State University. The four cycles vary greatly in accompaniment. "Five Blake Songs," performed by soprano Ann Moss, has solo clarinet as the backdrop; "Four Songs of Solomon" brings in a full symphony orchestra (the Moravian Philharmonic) and is sung by tenor Andrew Childs; "Neutral Tones" uses solo viola and is sung by baritone Chris Thompson; "Three Donne Songs" brings back Ann Moss accompanied by string quartet. The lyrics are uniformly worthwhile: William Blake, Biblical, Thomas Hardy and John Donne give us words that evoke and are good to contemplate. The settings seem very right for the lyrics. The music is melodious, modern in a tonal way, deceptively straightforward. Accompaniments further the songs and echo the various moods appropriately. All show the signature style of a contemporary craftsman-artist of original stripe. The voice writing seems very natural, unforced and giving the voice qualities pride of place. Vocal soloists and instrumental forces all perform well according to the demands of the music. There is drama, melancholy, joy and reflectiveness as needed. Murray leaves us with some very memorable music, songs that hold their own as themselves, reflecting the rhythmic feel of the poetry and so sometimes folkishly archaic, sometimes freely expressive. always inventive and movingly unified. Murray gives us songs that stand out. They are masterful examples of the form in our contemporary world. Anyone who gravitates towards such things will no doubt appreciate this album. Bravo! When you think of improvisations for solo piano you immediately assume there will be dramatic differences when played by someone in the "jazz" camp versus someone coming out of "classical" music. Certainly what someone like Art Tatum played in 1950 did not have a good deal to do with classical music, though his technique rivaled some of the best classical virtuosi. Yet as we get further to the present the influential solo styles of a Keith Jarrett or a Cecil Taylor may sound more classical or avant classical compared to what went before. That is not to say that Cecil T. is a classical player of course; he is in his own right, very much a force of ONE. Jarrett on the other hand does play classical music as well as jazz, and in his solo improvisations the roots of both musics can be heard depending on the moment, on the directive spontaneity of his inspirations. Where avant classical players are concerned, they can also veer towards avant jazz or free music too, especially if they occupy a "new music" territory more divorced from tonal and structural tendencies in earlier classical music. There is something of a convergence and cross-pollination taking place to some extent between both camps. 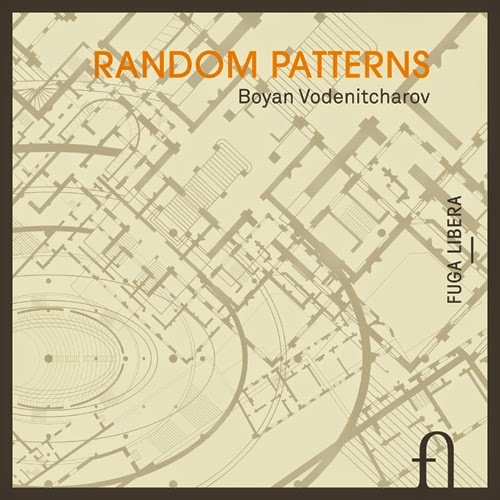 All this brings us to Russian pianist Boyan Vodenitcharov and his album of piano improvisations, Random Patterns (Out There/Fuga Libera). He is of the classical camp in terms of roots. The album of improvisations we have at hand is filled with inspired impromptu performances that vary one from the other, now cascading tumultuously with post-Scriabinesque, post-Taylorian energy, now delving into adventurous territory that channels rock rhythms or jazz use of scales and harmonic movement, now sounding in contemporary new music realms, now working with motival ideas. If you sometimes hear a channeling of some of a Jarrett influence, it is not direct and perhaps derives from models Jarrett has taken from classical music. What parallels you can hear are not imitations but deeply rooted tendencies that come out for Vodenitcharov in original ways. So any influences one might hear are not worn on Vodenitcharov's sleeve, so to speak, but rather are thoroughly integrated into the personal expressions he realizes. The music comes out of all the music Boyan has played and heard, no doubt, in the course of his musical life. That he began improvising at an early age, as he recounts in the album liners, means that what we experience in his playing today has been cultivated over the years. He attains a full maturity in the present, as we hear clearly and delightfully in this program. 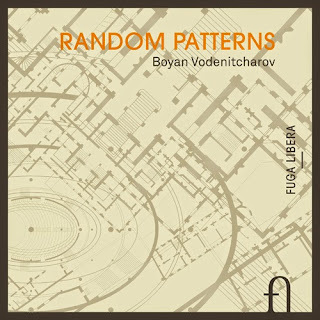 Vodenitcharov on the basis of this recording is an improvisatory stylist in his own original way. There is nothing predictable about where he goes from interlude to interlude, except a uniform substantialness and a wealth of personal inspiration. The album will interest anyone pianistically oriented, surely, and especially those who would welcome a new voice on the improvisational horizon, classically rooted but travelling far and wide to where he hears the music inside himself. As today's CD at hand informs us, the Sevillian 16th Century church composers Francisco Guerrero (1528-1599) and Alonso Lobo (1555-1617) gained such renown that their music was performed frequently for centuries afterwards in cathedrals in Spain, Portugal and the New World. Yet today we do not know them well. 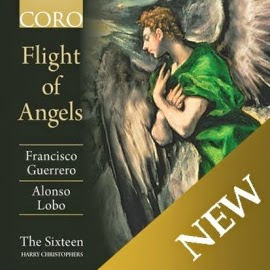 Harry Christophers and the Sixteen seek to put that to rights in the recent anthology of sacred vocal works by the two, entitled Flight of Angels (CORO 16128). There are 12 beautifully contrapuntal works represented in all on the disk, divided between the two masters. As always the Sixteen and Christophers give us sparkling performances that are all we could wish for, pristinely articulate and brightly expressive. The short pieces, some from settings of the Mass, others motets, express liturgical themes quite varied in mood from joyful to sorrowful, with brilliant contrapuntal interplay worthy as some of the most accomplished and sonorous examples of the age. It is perhaps one of those anthologies that you didn't know or anticipate would be central to an appreciation of early vocal music, yet that is certainly so. The Sixteen and Christophers once again show what a treasure they are. Get this one of you can. You will not be disappointed. Anyone who lived from 1897 to 1986 saw an enormous amount of change both in the musical world and the socio-political one. Composer Alexandre Tansman was such a person. Growing up in Poland he migrated to Paris in 1919, where he was exposed to the burgeoning new music scene there. From that point on his music abandoned a late-romantic rooted style for one more cosmopolitan and modern-oriented. 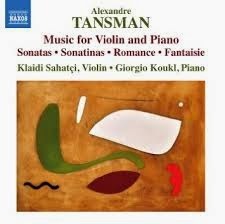 You can hear the shift and the development of his music rather clearly in the new volume Music for Violin and Piano (Naxos 8.573127), with Klaidi Sahatci taking the violin parts and Giorgio Koukl on piano. Tansman's "Romance" (1918) and his "Sonata No. 2" (1917-19) mark him as composer of promise. They are rather firmly in a late-romantic style, rhapsodic and not yet entirely original sounding. His move to Paris and subsequent musical development can be heard in the works that follow, presented chronologically on the program. The "Sonate quasi una fantasia" (1924) marks the shift and maturation of his music with some striking invention. The violin part continues to be highly expressive, but the framework has shifted to one more harmonically and melodically expanded. It is a work of considerable merit and gives us a Tansman influenced by Ravel and the French school of the era, but also with something eastern and/or Polish in its inflections. It does not sound like Prokofiev but it also has some kinship with him in its drive and bittersweet quality and at times there are echoes of his Polish homeland in some of the melodic and rhythmic content. The "Sonatine [No. 1]" (1925) has a drive and even more of a comradery with French impressionists. There is an increasingly lyrical modernism at play. The music brings folk and popular dance elements, even a bit of a jazziness with a foxtrot movement that exists jauntily alongside a lyric and slightly edgy violin part as a whole. All that combined gives us a Tansman we can certainly by this point call original. The music is memorable and has been neglected for far too long. We jump ahead to 1941 and his "Sonatine No. 2." It continues the lyricism that has been with him all along and yet there is an increasing translucency in the piano part that is contemporary in an impressionist way. There is the tang of modernism without much of the stridency that was in vogue among many of his contemporaries. Yet there is a rhythmic vitality and complex melodic character to the music, especially in the final movement, and all that marks him as of his time. It is his way here to stick with and grow upon the implications inherent in his early modern lyricism that puts him in his own original world. The final work, the 1963 "Fantasie" is a good deal more harmonically advanced and brash than what went before. The complex driving motor qualities are ever more pronounced, the interplay between violin and piano ever more dynamic and brilliant, and a virtuoso vivaciousness is more at the forefront than with the previous works. The first movement shows this tendency with breathtaking presence. Then follows a tenderly lyrical slow movement that continues that element of Tansman at its most completely original. A chromatic fugal theme develops in the third movement that is a wonder to hear. The following movement explodes forward in a very dramatic restatement of the fugal passages that must be experienced to appreciate. Another, simpler and more diatonic fugal movement follows, with the simpler tonality functioning almost as a rejoiner to the turbulence and resignation (if that fits the mood) that precedes it. The final movement gives voice to a great, energetically vital expressive stridency that conveys much momentum and excitement. And so it all ends. Sahatci has the expressive and technical means to pull off the violin parts impressively. Koukl has a dynamic and rhythmically acute knack to make his crucial role felt with real sympathy to the music. They form a team uniquely suited to the very diverse shifts in expression that are so much a part of this music. This volume gives us four of six of the works in their premiere recordings. Why the mature music has been so neglected no doubt has to do with Tansman's not belonging to prevailing modernist schools that had such a powerful force on the music scene in the last half of the 20th century. I can come up with no other reason, for the music most certainly bears our attention. The performances are just right and the music stands on its own as very well-crafted, generally inspired and increasingly original as Tansman came into his own. The music gives us much to appreciate.